When the RNC did their post-2012 autopsy, which suggested that the Republicans needed to do a better job of reaching out to people of color (specifically Hispanic Americans), there were two issues on the horizon: (1) George W. Bush had garnered 40% of the Hispanic vote in 2004 against John Kerry. By 2012, that number had dropped to 27% for Romney against Obama. 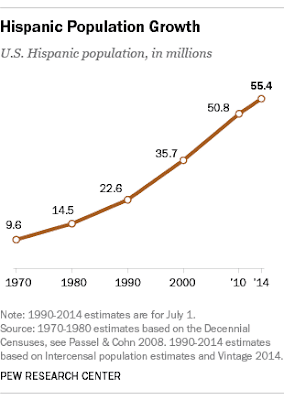 (2) The Hispanic population in this country was growing more than any other racial/ethnic group. What hasn’t been discussed as much is that Hispanics have a very low record of voter participation. 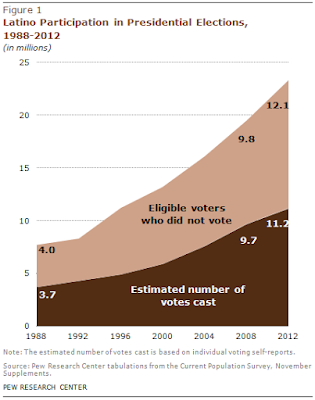 Overall, 48% of Hispanic eligible voters turned out to vote in 2012, down from 49.9% in 2008. By comparison, the 2012 voter turnout rate among blacks was 66.6% and among whites was 64.1%, both significantly higher than the turnout rate among Hispanics. In other words, in 2012, 12 million Hispanics chose not to exercise their franchise. With Donald Trump as the presumptive Republican nominee, it is possible that could change. Activists, lawmakers and political consultants around the country say Hispanics are flooding into citizenship workshops and congressional offices and jamming hotlines on how to become U.S. citizens or register to vote. Many say they are primarily motivated by the rise of Trump, who has proposed deporting 11 million undocumented immigrants and building a wall on the U.S.-Mexico border. In California, the number of Hispanics registering to vote doubled in the first three months of this year compared with the same period in 2012, according to state data. In Texas, naturalization ceremonies in Houston have swelled to about 2,200 per month, compared with 1,200 before, according to an analysis by the Houston Chronicle. More than 80 percent of those naturalized then register to vote, compared with 60 percent previously. According to the most recent national statistics, more than 185,000 citizenship applications were submitted in the final three months of 2015, up 14 percent from the year before and up 8 percent compared with the same period ahead of the 2012 elections. Experts expect a similar, if not larger, uptick for the first three months of 2016 when new federal data is released in coming weeks. Will Trump’s candidacy awaken the sleeping giant of Hispanic voter participation? It is possible that the forces of racism, nativism and fear on one side will be met with a response of “Oh no you won’t!” on the other. This is definitely a story to keep an eye on.